This week has not been the best in terms of my New Year's resolutions. I have failed at watching any new DC movies (or even their new show Doom Patrol) and am bringing you all a trio of Marvel reviews including two major titles. I will admit that I feel a bit intimidated hopping into the Valiant Universe, but will make an effort to improve moving forward. 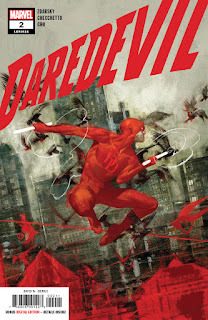 Daredevil #2 - Chip Zdarsky is not wasting any time bringing us a thrilling new arc for Daredevil. After being framed for a murder, Daredevil is struggling to figure out who set him up. He investigates a couple of leads, but not even Foggy believes that he is innocent. Grasping at straws, he finds himself back at the scene of the crime and runs into a pair of detectives who are looking for him. If there is one thing you don't do when you meet a pair of cops looking for you is attack them. Daredevil goes on the offensive and suffers some major repercussions. There is a lot to unfold, including the new detective who is on the case and his conversation with Fisk, and it appears that once again this series has done a great job passing the torch to a new creative team. Doctor Aphra #29 - In a very Running Man-esque plot, Aphra must remain close to Triple-Zero to prevent their proximity bombs from exploding. Doctor Cornelius Evazan is broadcasting the entire event as they race to find the one specialist in the galaxy that can remove the bombs in time. The audience remains captivated as the two appear to grow as friends through their trials and tribulations, but a bounty hunter has an effective trap that might ruin the entire gambit. The witty dialog between Aphra, Triple-Zero, and BeeTee (who makes a late appearance) brings me back to the early days of the comic when the trio was working with Vader. This has been a fun arc. 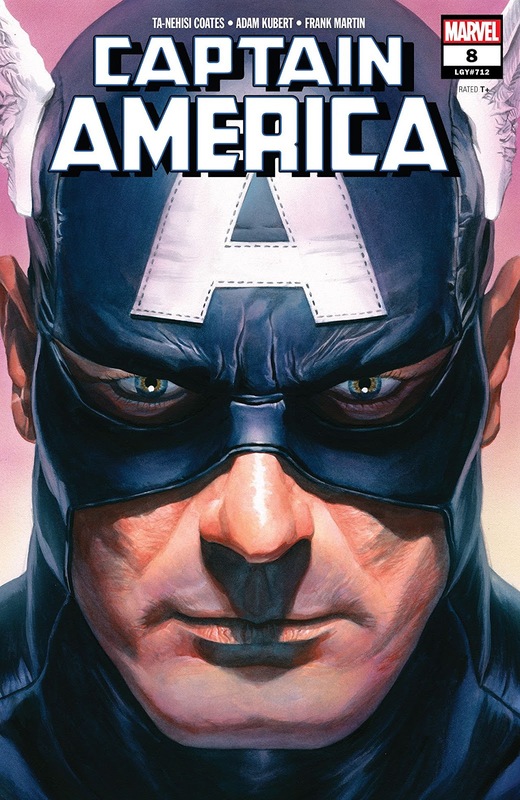 Captain America #8 - Speaking of super heroes with legal troubles, Steve Rogers finds himself locked up in a prison designed for people with super powers after being framed for, wait for it, a murder he didn't commit. Rogers was framed because a man who looked like him installed a Hydra regime that didn't earn him any fans. That regime has been overthrown, but Rogers has a lot of enemies and is currently locked up with a lot of them. Fisk is mayor in this scenario and it makes me wonder where this fits with what is happening to Daredevil. Is Marvel possibly setting up this year's summer event? Doubtful, but fun to think about. New Suns ed. 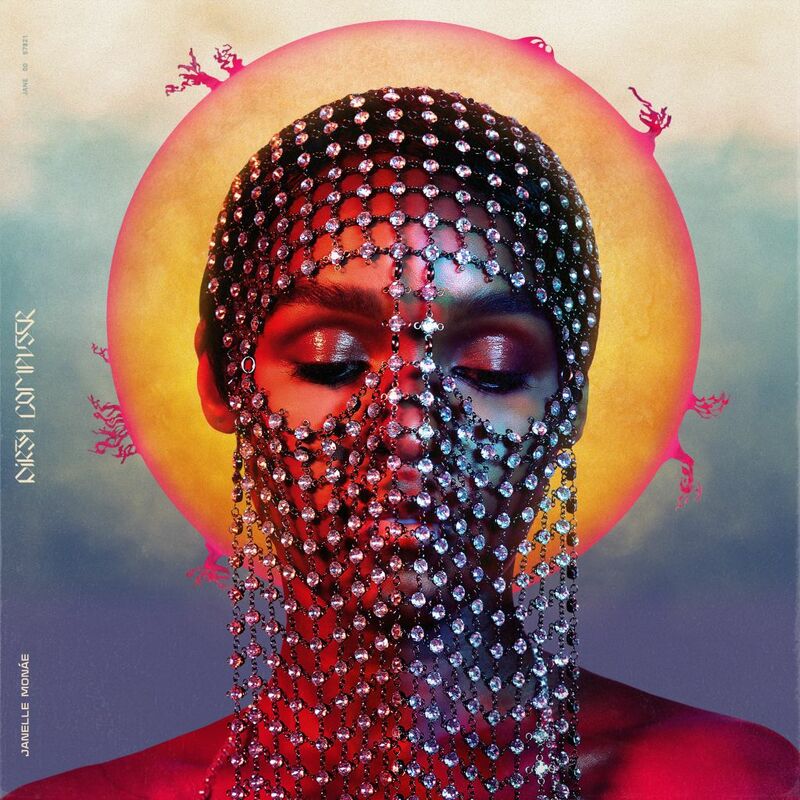 Nisi Shawl (2019). 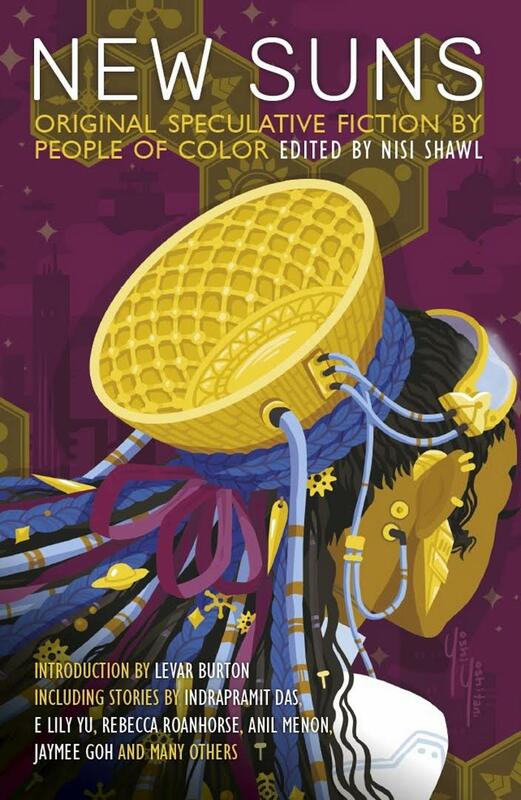 This anthology of original speculative fiction by writers of colour has been put together by the magnificent Nisi Shawl, which is an early indication we're all going to be in for a great time. The seventeen stories within are varied and interesting and there's a good proportion of authors I already love, including Silvia Moreno-Garcia and Rebecca Roanhorse, and new-to-me names. The breadth of stories, tones and styles on display here is entertaining and, I think, important, making it abundantly clear that the work of authors of colour can't be reduced to a single set of issues or sub-genre or to the ever-shifting label of "message fiction". There was so much interesting stuff in here that it's tricky to pick favourites: "The Galactic Tourist Industrial Complex" by Tobias Buckell hit some great notes on the theme of intergalactic inequality and dependency, casting Earth as an "undiscovered" tourist spot for aliens, and the exploration of humans trying to live their lives and maintain their own culture against the constant stream of visitors is very well done. "The Virtue of Unfaithful Translations" by Minsoo Kang, told through the form of a historical text examining a war averted between a mad emperor and an ambitious sea captain, is beautifully written and contains a well-crafted sting in the tail of what could otherwise have been a romance for the ages. Rebecca Roanhorse's "Harvest" tells of a fling between Tansi, an aspiring chef, and a deer woman with murder on her mind, and is told with Roanhorse's talent for slow burning entrapment and horror even within the space of fifteen pages. And while it was a bit left-field, I have a real soft spot for "One Easy Trick" by Hiromi Goto, about a woman who finds a way to magic her own belly fat away and learns that it was a more important part of herself than she ever imagined. 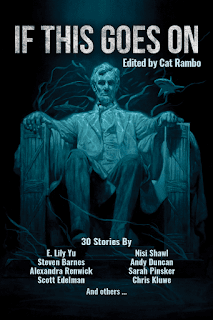 This is a great anthology to dip into, either story-by-story or in one super varied read, and I'm happy that it's put some great new authors on my radar. If This Goes On, Ed. Cat Rambo (2019). 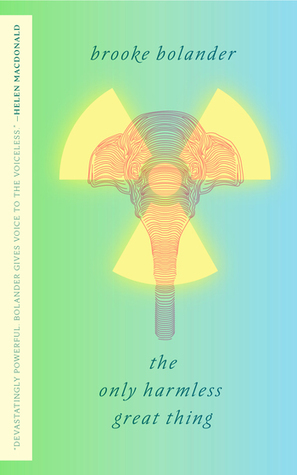 This collection, kickstarted last year by the small Parvus Press, sets itself an interesting goal: encompassing the sense of disaster and impending doom that current political and environmental factors evoke (mainly focused on the USA) while also incorporating notes of hope. The result is slightly uneven, as some stories contain little more than a grimly extrapolated premise, but others do shine. Of these, it was the stories with a feeling of historical weight to them which really grabbed me. "Mr. Percy's Shortcut", by Andy Duncan, recounts the tale of an Appalachian miner - one of the few in his version of the future who hasn't switched to data mining - who spends his life digging through a mountain in order to reach the other side. It's a story of almost nonsensical triumph, but it feels "lived in" and the speculative elements are compelling but understated. On the much grimmer side, the stories "A Gardener's Guide to the Apocalypse" and "Free Wifi" present very different testimonials which we have reason to suspect would never be canonically read - the former, by Lynette Mejia, is a diary charting a year in the life of a gardener recording the growth around her despite the destruction which has taken all but her and her partner; the latter, by Marie L. Vibbert, a story of young rebellion in a corporatised world which is crushed in actuality but not in spirit. Both have strong character voices, underscored by the modes of telling, which really underscore the premises and stop them from being too grim despite the subject matter. 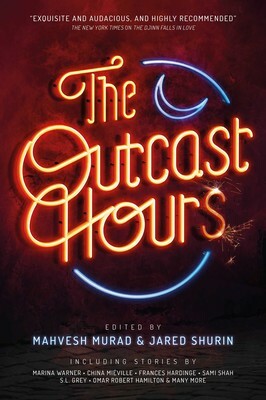 Some other gems in here include "Welcome to Gray", by Cyd Athens, a superhero origin story with notes of Henrietta Lacks and a great subversive take on representing dialect, and E. Lily Yu's story, "Green Glass: A Love Story", a no-expense-spared romance in very late capitalism which manages to keep the protagonist's wish - to have real ice cream served at her wedding - naively sympathetic, without flinching from showing the widespread destruction and misery which surrounds those without the means to keep themselves insulated. All in all, this is a neat little collection despite its ups and downs, and while it's very tied to the political moment, if you're interested in on-the-pulse speculative fiction this is one to consider. 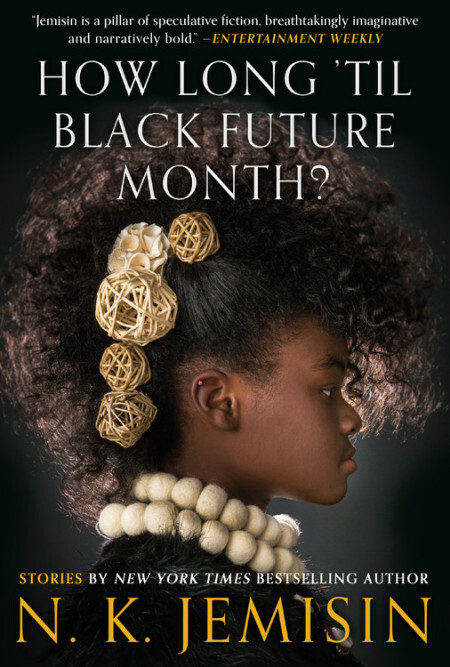 How Long 'Til Black Future Month by N.K. Jemisin (2018). This is the first collection (i.e. a set of stories by a single author, whereas an anthology is a set by a group of authors brought together by a particular editor) I've covered in this roundup so far, and it's going to be a hard act to follow. I've read a couple of N.K. Jemisin's shorts before - notably, "The City Born Great", her Hugo-nominated urban fantasy of a couple of years ago, as well as some fiction around the Inheritance Trilogy (which is notably absent here). Lack of god-politics aside, if you're a fan of N.K. 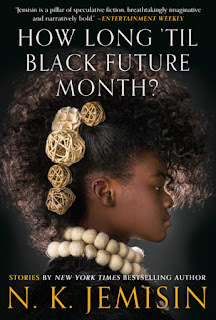 Jemisin then this is definitely a collection you will want to read. Spanning well over a decade of Jemisin's writing career, and running the genre gamut from space-faring science fiction ("Cloud Dragon Skies", "The Evaluators") to alternate history ("The Effluent Engine") to dystopian realism ("The Elevator Dancer") and urban fantasy ("The City Born Great", "Sinners, Saints, Dragons, and Haints, in the City Beneath the Still Waters"). The worlds of the Broken Earth and of Dreamblood both put in appearances, in "proof of concept" stories which predate their respective novels, and there's a pair of stories, "The Trojan Girl" and "Valedictorian", set in the same post-singularity reality from very different perspectives. 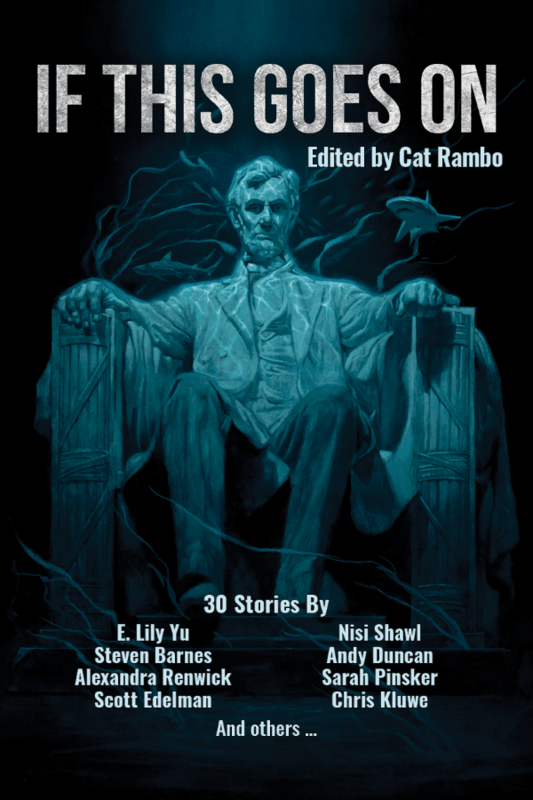 There's so much good stuff in here, but I particularly want to highlight one which most represents the volume as a whole: the opening story, the "The Ones who Stay and Fight". As the title suggests, this is a response to Ursula K. Le Guin's "The Ones Who Walk Away from Omelas", set in Um-Helat, a city of generally kind people living sustainably and harmoniously, and actively working to correct the injustices of the past and maintain their society as it is. In introducing this society, the narrator holds a dialogue with a fictionalised version of the reader, challenging their inability to suspend disbelief for a society bent towards compassionate progress without any dark "catch". Why is it so hard to believe that a kinder, better society is possible - and even if it isn't, what value is there in insisting, angrily, that hatred and suffering must always be present? It's a theme taken up in so many ways, big and small, by Jemisin's stories in this collection and beyond: where protagonists are often trying to exercise agency and dream of better things in the most imbalanced, hopeless of situations, and those who stand in their way are often not the characters who do incomprehensibly awful things - who are often complex, sympathetic and sometimes even redeemable - but who uphold and insist on the status quo which brought those "evil" acts about. "The Ones who Stay and Fight" explicitly challenges us to question where our suspension of disbelief kicks in, and why, and while that self-examination isn't strictly necessary to enjoy the rest of this collection, it's an exercise that we can only benefit from. 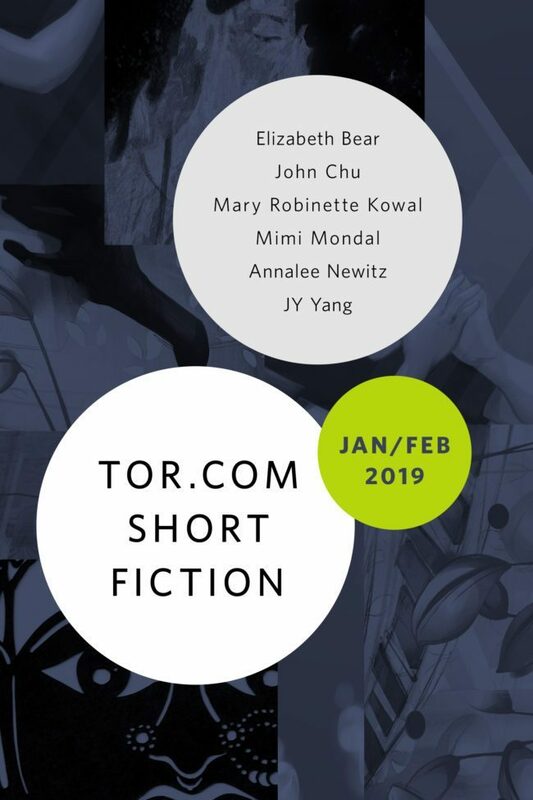 Tor.com's short fiction output hardly needs any introduction, but what might have escaped some peoples' attention is that there's now a free subscription service where they will send you a bimonthly ebook of stories published on the site for your e-reading pleasure. While this doesn't seem to be every single one, getting a free collection like this is still a no-brainer for me, and there's a range of fascinating stuff here by some great writers. "Deriving Life", by Elizabeth Bear, is a story of life and love in a world where people can guarantee a reduced but painless term of life by becoming a host to an alien parasite, explores its concept through the lens of a relationship between a dying host and the lover they are leaving behind. It's a deeply nuanced look at autonomy and the choices we make now and for our own futures, and while it doesn't offer any easy answers it maintains a huge amount of compassion towards its (queer) characters. Another favourite was "Circus Girl, the Hunter and Mirror Boy", about a woman who used to have the ghost of a drowned boy as her reflection, who reappears in her life right as he's being hunted down. The themes of identity are particularly interesting in JY Yang's atmospheric ghostly tale. For fans of Mary Robinette Kowal's Lady Astronaut stories, there's another piece of punch card punk history here: "Articulated Restraint", a story of Elma York's colleague Ruby working a training mission that suddenly becomes much more serious and painful than expected. Ruby's voice and drive wasn't distinct enough from Elma's to really invest me in this as a standalone story, but taken with the rest of the series it's another interesting window into the ambition and fortitude expected of women trying to break through a militarised patriarchy in this high stakes world. There's also a piece from Analee Newitz's Autonomous world, "Old Media", which follows a couple of the characters from that piece in a sweet slice-of-life story about recovery, anime and naps. Worthy stories by Mimi Mondal and John Chu round out an overall very strong set of stories with lots of variety and food for thought. 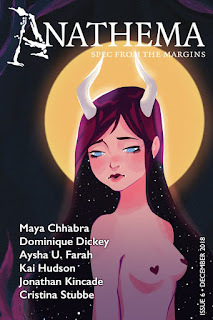 Anathema's tagline is "Spec from the Margins", publishing queer speculative fiction from POC/aboriginal/indigenous creators, and this is the second issue of theirs I've read. Based on my experiences so far, I can confirm it's a magazine that's well worth your time, but one which requires a particular mindset to sit down and enjoy; in this issue in particular, every single story bursts off the page with loss and grief and while it's an exquisite, well-crafted sort of pain which never feels gratuitous, it's still a hard thing to get through. Among the best, most painful experiences in here are those dealing with families going to unimaginable lengths to hold together. In "There Are Ghosts Here" by Dominique Dickey, a young boy's life cut short under violent circumstances begets a similarly grim sacrifice from his sister and cousins, held together with magic that is simultaneously mundane and extremely creepy. "The Plague House" by Maria Chhabra follows Catia, one of the few people immune from a deadly, unpleasant plague that is sweeping through her city, as she nurses the sick, watches those around her succumb and tries to save the life of one particular girl left in her care. It's a story which handles its body horror extremely well, driving home the awfulness of the plague without dwelling too deeply on the physical horror at the expense of the wider pain that people are going through as a result. The issue closes with "Pale Blue Dot", by Kai Hudson, an understated but equally powerful story about a family's survival in the face of economic uncertainty, even with the promise of the stars on their doorstep. Also of note is "This is the Nightmare", by Aysha U. Farah, which is a compelling futuristic Sherlock Holmes riff whose eventual direction left me guessing until quite near the end. The use of technology here - and particularly the "personality" that the Sherlock character ends up giving her unwanted robot pall - will make any reader who remembers their angsty teenhood wince in sympathy, but the relationships and setting make it so much more than an exercise in vicarious teen nostalgia. All in all, Anathema is a publication that's worth giving your heart to, even when you know its going to crush it with every page. It's the UK, 2012. Summer is coming, the Olympic spirit is setting in, and in London, six teenagers are about to join a 10-person mission to a planet in a nearby system, which humans have discovered is almost a mirror of our own world. The UK Space Agency, which has held its own against the cold war superpowers even as the USA makes it to the moon and the Russians are the first to land on Mars, is eager to be the first onto the planet. The six crew members chosen to start colonising Terra-Two have been training at an intensive space academy for years, and are finally ready to take their place on this twenty-three year mission into the unknown. That is, until things start to unravel on their very last day on earth, throwing the entire mission and the capacity of the crew to undertake it into doubt. 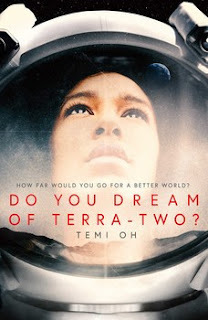 So opens debut YA science fiction novel from Temi Oh, a claustrophobic not-quite-generation-ship story which quickly turns into a psychological meditation on its small cast of characters. The narrative is told from the perspective of each of the kids of the "Beta" crew, including Jesse Solloway, a last-minute replacement selected from their backup team, whose sudden inclusion in the final lineup won't be a surprise to readers given that his point of view is literally in the first section (though I'll leave the exact circumstances of his promotion a mystery). Aside from Jesse, there's also golden-boy alpha male Harry; artistic, passionate Ara; awkward mechanics expert Eliot; underprivileged hyperpolyglot Poppy; and Astrid and Juno, twins with very different outlooks on the mission and their places within it. There's a complement of adults too, who mostly fall along a spectrum of being kind but curmugeonly, but the focus is very much on the youth contingent of the mission and the kids' specific problems - there's definitely a sense that these are young people who haven't quite internalised the fact that the "teachers" have their own lives and struggles, even if they intellectually know about the challenges their seniors must face. By opening the action around the Terra-Two mission, and the tiny complement of students who get onto it from the academic pressure cooker of Dalton academy, Oh sets up an interesting moment to start the story. By this point, all of the characters have spent years in each others' company to some extent, and while some clearly know each other better than others - there's a notable divide between Jesse and the crew who were originally selected - we are still reading about relationships that have a great deal of baggage behind them, and the whole that's handled quite well. At the same time, setting the action at the start of the crew's 23-year journey makes the distance to the planet insurmountable. I suspect it's no accident that the title frames Terra-two as a "dream": a planet that will somehow provide all the answers to an overcrowded, dying earth, packed with natural beauty and already habitable for humans, somehow becoming more and more unreal with every detail we learn that conforms to the way things are on Earth. The fact that this mission seems so dreamlike, and the protagonists feel so underequipped, may be frustrating for readers seeking a more Seveneves-esque tale of human ingenuity in the face of interstellar adversity, but that's sort of the point: there's a subtle but increasingly clear message that we are supposed to question the design and realism of this mission, even while the teenagers themselves are fixated on their own destinies and, more practically, surviving long enough to arrive with them. At the heart of Do You Dream of Terra-Two is an interrogation of a point I rarely see made so well: what makes someone gifted, or a leader? All of the teenagers selected for the mission are indisputably talented and driven, and have been placed in a school environment which is clearly intended as its own test of their commitment and capabilities, with very little introspection offered or encouraged about what this pressure actually qualifies them to do. The selection of Harry, the ship's most privileged white male, as not only the pilot-in-training but also future commander (jobs which it is assumed are automatically linked) is the most overt result of that system, but the attempts by Juno, Astrid and even Jesse to articulate their own aspirations for the future, and test the assumption that they are best placed to lead others into it, are equally interesting. At no point does Oh allow us to forget we are watching barely-adults figure themselves out, and much of the tension comes from watching them do so on a spaceship where there is literally no escape from each other or their precarious situation. That it does so - and lets its characters make horrible choices and unforgivable mistakes without ever crossing the line into being unlikeable characters (with one possible exception) - is a testament to how well crafted the psychosocial elements of this text are. Although I found much of Do You Dream of Terra-Two successful, there were still parts that didn't work as well. Although this isn't a short book, the inclusion of so many point of view characters, all with multiple problems and plot strands, means that some elements do fall by the wayside. This might also be intentional: for example, one character has an eating disorder that is, in hindsight, pretty well signposted but never "developed". The fact that readers are likely to forget about it in between "wait, that doesn't sound healthy" cues reflects how the weight of stress on all the characters prevents them from noticing these things about each other. If that is what's going on, though, it's subtle to the point of being frustrating, at least from a plot perspective. 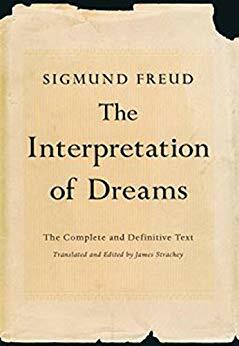 The more overt mystical elements in the text - like Astrid's prophetic dreams, or the visions Eliot has of a former classmate - also struggle to find purchase in amongst everything else that's going on. More disappointingly, the mystic lens given to Terra-Two also seems to prevent any discussion of the planet, or of the journey the crew are undertaking, from a colonial perspective. All of the Beta crew - who are equally split between white and PoC members (for the record, they all present as cis and heterosexual, and no disabilities beyond mental health issues are ever pointed out... sigh) - project blank canvas visions onto Terra-Two, but at no point is the UKSA's "Off-World Colonization" project linked to the country's colonial past and its legacy. It's particularly noticeable that neither Astrid and Juno, who are Black Kenyan and had a very international upbringing, make the link between their roles on a prestigious British mission (side note: it turns out, late in the book, that their father is a missionary, which is a whoooole other situation in itself), and the assumptions they are now making about taking "ownership" of Terra-Two when they arrive. Instead, when the planet's future isn't being seen through the lens of selfish teenage aspirations, it's effectively treated as a new "frontier", in which the UK needs to turn up and plant its flag first before all the other countries arrive and claim their own territory. I accept that not all books can be all things, but in a book that is so open in other ways about drawing on contemporary British identity and all its contradictions, the lack of any interrogation on this point is jarring. Despite its problems, Do You Dream of Terra-Two is a book with plenty to recommend it to the right audience - though its preoccupation is far more on the thoughts and development of its young protagonists than the end goal of the trip they are on, that psychological element is handled with immense skill, and for a debut author this definitely sets Temi Oh up as someone to watch. There may not be any more story to tell when it comes to the journey of the Damocles, but I'm definitely interested in more smart, relateable and subtle fiction in whatever future worlds - tangible or otherwise - the author chooses to visit in future. Bonuses: +1 subtle, multi-layered psychological drama that really capitalises on the situation and challenges the characters face. 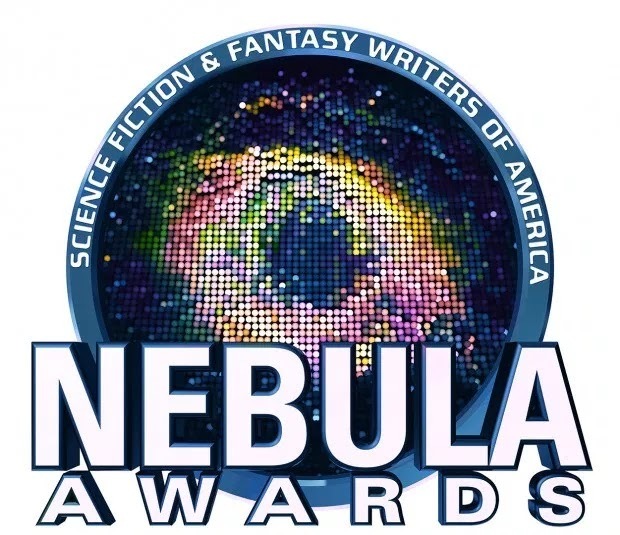 Joe: The finalists for the Nebula Award have been announced and you’re on holiday in Costa Rica. Joe: Okay, so, when we last talked about the Locus Recommended list, we attempted to do some forecasting for the Nebula and Hugo Awards. In a very nice turn of events, five of the novels we thought were strong possibilities or near locks for the Nebula ended up as finalists. People should *clearly* follow us for our prognostication. Adri: Indeed - finger on the pulse of genre and all that. I can't say there's anything that made the novel or Norton lists that I'm particularly surprised about: even though we didn't see Witchmark coming, it's had the sort of buzz around it that made me go “oh, of course” when it arrived on here. Also, the thing I always like about the Nebulas is that the long list always encompasses a couple of books that I want to see recognised but worry don't have the backing, as you mentioned for The Poppy War in our last chat. Joe: I completely agree about Witchmark. Should have seen that coming as a possibility, but I also forgot that it was novel length and was otherwise expecting to see it in novella. My big surprise in Novel, though, is Space Opera. Or, rather, the lack of Catherynne Valente’s Space Opera on the ballot. It was one of the most talked about novels of the year in a number of different spaces. Of course, what do you kick off? That’s a stacked novel ballot. Adri: That's true. It's a shame we never get longlists for the Nebulas as it would be fun to see what's bubbling under: Space Opera is an obvious gap for sure, and I'm also surprised nothing like Circe made the cut. What's interesting to see here - which I think was true for last year's ballot as well - is how many of the novel nominees are debut or near debut authors. 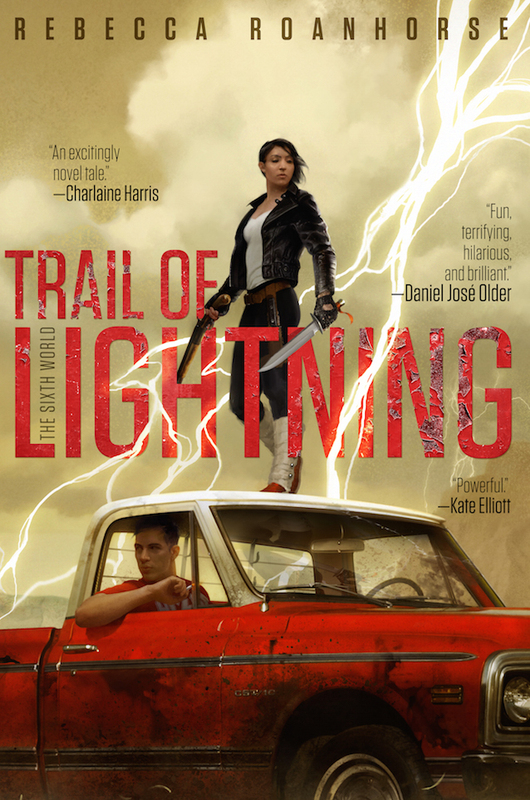 Trail of Lightning, Witchmark and The Poppy War are all first novels for their writers, and I believe Blackfish City is Sam J. Miller's first adult novel (though he previously took home the Norton for the The Art of Starving). Peasprout Chen: Future Legend of Skate and Sword and Children of Blood and Bone are first novels too. To me that suggests that voters are seeking to read and celebrate new voices and that gives me a lot of hope for the future in general. On the other hand, some of my favourite 2018 novels including Revenant Gun and Before Mars (both incidentally on the BSFA ballot which was also recently released) are third books, which by definition are not debuts, and therefore not here. Joe: I don’t know that I want to do the research, but I’m curious about the history of debut novels and the Nebulas (and the Hugos for that matter). I dig the idea of voters looking to celebrate new voices, but I wonder if there is something to the idea that the nebulous “we” love to celebrate debut novels at the expense of second, third, and fourth novels. 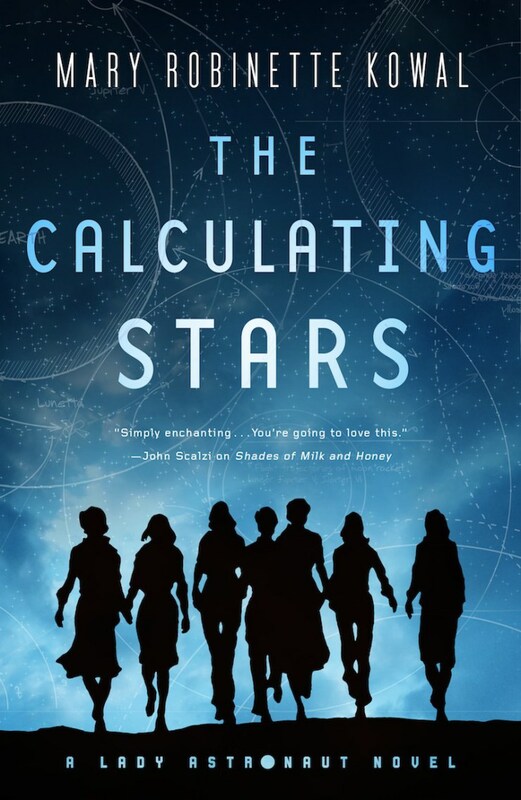 That doesn’t completely hold up when we look at any given awards list (The Calculating Stars is Kowal’s seventh novel, for example), but I think it does when we consider how we talk about the genre as a whole. If we’re going by the debuts you mentioned here, we’re absolutely not wrong to celebrate these new voices. We’ve ranked them among our favorites and the best novels of the year, but besides that sublime reading experience they offer raw promise for the future. One of my favorite aspects of the Hugo Awards (besides getting to lose one in person and then getting to go to a party with dancing robots) is after the awards are given the voting and nominating statistics are released and you can see how close the next one up. I am absolutely with you in wishing the Nebulas did the same thing, and I wonder if we’d see Space Opera just missing the ballot by a couple of votes. Adri: The Norton list is, of course, also bringing me a lot of joy. Last year there were somehow only four nominees so it's great to see a full house again, and having adopted it as my one true title of 2018, seeing Tess of the Road there is glorious! It's also nice to see Peasprout Chen, and I know the Adeyemi and Ireland are both great too. I'm sad to say that despite the amount of buzz it's generating, I haven't yet picked up any of the Rick Riordan presents line, represented here by Roshani Chokshi's novel, Aru Shah and the End of Time. The imprint features a range of middle grade novels from diverse writers whose books might not otherwise reach the kind of kids who are devouring Riordan's own wildly popular novels (e.g. the Percy Jackson series). I love that this line exists - even if it's not technically in the UK yet - and that it seems to be bringing middle grade a bit more into the SFF adult mainstream. I'm not a massive YA/MG reader but there's lots in those broad categories that I do enjoy, and I'm planning to make time for some of this line later in the year. Joe: I’ll admit to only having read Children of Blood and Bone from the Norton, but it’s a list mostly full of stuff I’ve at least heard of and plan to read in that mythical “someday”. It’s interesting that you mention the Roshani Chokshi and the Rick Riordan line. I haven’t thought a lot about the line, but Riordan just published Yoon Ha Lee’s first YA novel in January and will publish Rebecca Roanhorse later this year. Those are two books that will help raise the profile of the line within “traditional” genre conversations. Of course, Riordan’s name itself is huge on its own. Aru Shah and the End of Time is the first novel published by Rick Riordan Presents last year. Getting on the Norton ballot the first time out is a big deal and a way to make a huge statement about what sort of quality we can expect from the line. Adri: This is the first year of the new game writing category, and it's… interesting. I have to admit, while I try to avoid getting frustrated about what other people find award-worthy, the presence of Bandersnatch is giving me a strong case of the Opinions. 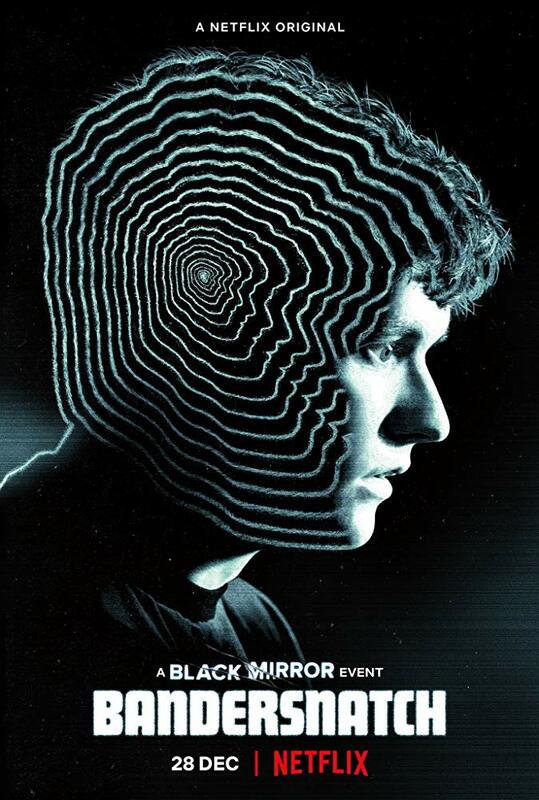 I admit I'm not a Black Mirror enthusiast at the best of times, but I thought the “game mechanics” and resulting ethical questions of Bandersnatch were particularly crude and cynical. The most obvious comparison to me is to Undertale, a minimally-resourced indie game which also encompasses the choice to “reset” and explore new paths into the story itself, but which delivers a far more nuanced take even when it's subverting the concept of choice, rather than the “choose whether or not to pursue the one satisfying but horrible ending, oops now you're complicit in all the bad stuff” nonsense that Bandersnatch peddles. And, most obviously, Undertale includes a meaningful choice to be kind, whereas Black Mirror almost never allows kindness or altruism into its plots, and tends to punish characters if they do display anything other than opportunistic self-preservation. That's fine in moderation, but as an exploration of meaningful choice (even if that exploration ends up being a subversion) it makes things so much more limited from the outset. Games can be so much more and this feels like a missed opportunity. Now I've got that out of my system, clearly I need to check out God of War once my very long run with Pillars of Eternity II (a game that could belong here!) comes to an end. Joe: I’ve had a running conversation with a friend of mine who is a relatively new father (he has a one year old daughter) about what has changed after having kids. My video gaming has completely tanked while his remains unchanged. Of course, I still read more than 100 books each year and he has only read one book each of the last two years. Priorities. Of course, I’ve played Heavy Rain on the Playstation 3 (back before I had kids) and even granting the fact that I can move my character and sometimes need to make quick time button presses, I’m willing to accept the counter argument that Heavy Rain was more of a movie that sometimes let me use my controller than an actual game. Adri: it's an interesting grey area: there's lots of stuff in that “visual novel” space where actual "gameplay" is limited (and often leads down a single path) but just interactive enough to count as gaming to me. But Bandersnatch isn't what I'd have wanted representing that even without the “is it a game” angle. Joe: No? Witchmark is the only real surprise on the Nebula ballot and I’m not sure it makes a move for the Hugos. I’m with you on Spinning Silver and The Calculating Stars being near locks for the double, Trail of Lightning seems likely, and I think the Nebula nod might be a boost for The Poppy War if enough of the SFWA members who nominated it are also nominating for the Hugos. Plus, there is still some time before Hugo nominations close, which suggests that making the Nebula ballot could move the needle some more. 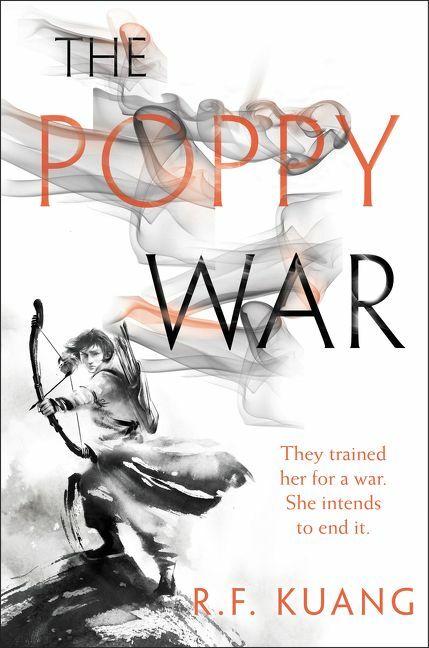 Mostly, I just really want The Poppy War to be a finalist for the Hugo. I’m halfway through Blackfish City and I still think it feels like a Nebula novel (and hey, it’s on the ballot so we must be on to something) and I just wonder if it went wide enough to make the ballot. Despite the lack of Nebula recognition, I still think Space Opera is likely to take one of the at large spots on the Hugo ballot. Mass popularity, science fiction in the vein on Douglas Adams (never a finalist for a major award, interestingly enough), and a well known and regarded author. Joe: There are a few surprises, at least to me, in the short fiction categories. The first, and most important, is the glaring lack of Sarah Gailey’s “STET” in Short Story. It’s experimental in its formatting and searing in pain, power, and grief. I still fully expect to see it on the Hugo ballot, but I kind of expected to see it nominated for all of the things. I haven’t followed the short fiction scene nearly as closely as I have in the past, so the other surprises are all of a kind. There are a number of self published / independently published stories on the final ballot. Jonathan Brazee was a finalist last year for novelette, so perhaps it isn’t a huge surprise to see Fire Ant on the ballot in novella this year, but I am very much not aware of the other three finalists (“Messenger”, “Going Dark”, “Interview for the End of the World”). They appear to be part of a group named 20booksto50k that must have a number of fairly active members in SFWA (A Light in the Dark on the Norton is also from that group’s recommendation longlist). Adri: Yes, the short fiction categories confused me, but I remember hearing about 20booksto50k around the Dragon Awards. It's interesting that they've found some success here, though I suspect the very economically focused nature of the group and the existence of a “reading list” might raise some hackles for those who have been present for certain recent genre events. I intend to check some of these out and I'll reserve my judgement until then. I agree that I expected to see "STET" here, although P. Djeli Clark's short is another great sounding Fireside story I've really been meaning to check out. 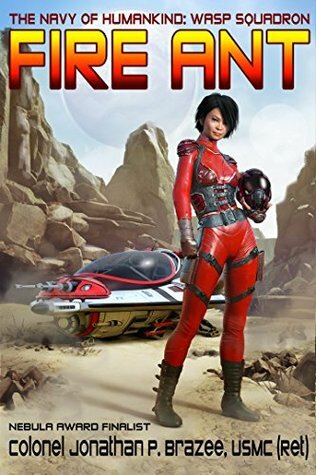 I'm also sorry to see that none of FIYAH's 2018 material made it onto the list in novelette or short story - I only read half their output last year, but it's such a good publication and I'd have hoped they'd have a better chance of Nebula success, as the Hugos seem to be skewing increasingly (and understandably) towards free-to-read short fiction venues. Joe: I’m not sure this counts as true prognostication, but I’d just like to compare the Nebula finalists to our Hugo Awards Longlist recommendations and see how we shake out. We were 4 out of 6 for Novel, missing Blackfish City and Witchmark. Given that our Hugo Longlist was built out of novels the flock has collectively read and could honestly make personal recommendations for, I think we did really well. 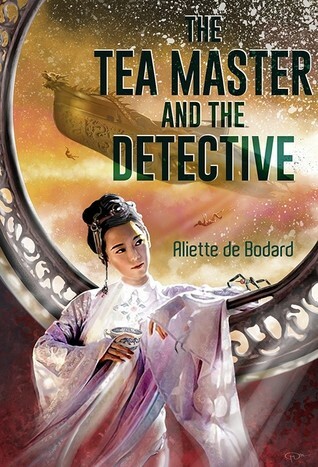 Novella we recommended 3 out of the 6 finalists, this time missing Fire Ant (not a huge surprise), The Tea Master and the Detective, and Alice Payne Arrives. Kate Heartfield’s novella was absolutely delightful and I highly recommend it even though it was left off our Longlist. Joe: We didn’t do nearly as well with novelette, nailing only the closest thing to a lock possibly on the entire ballot: The Only Harmless Great Thing. We did much better with Short Story, picking half of the finalists (we missed the Bruno, Fox, and Greenblatt stories). Our YA selections put in strong shape for the Norton, having recommended 4 out of the 6 finalists (missing the Choksi and the DuBoff). With our Dramatic Presentation recommendations, we ran the tables of the Bradbury Award. We recommended a different episode of The Good Place, but I say it still counts. Also, I tend to not put a lot of thought into the Nebula / Bradbury for Dramatic Presentation, but I’m somewhat surprised not to see Annihilation on the list of finalists given that the novel *did* win Best Novel in 2014 and I thought the movie was fairly well received amongst genre and publishing folk. Adri: As I mentioned before, my top books of 2018 have ended up being more eclectic than usual. It's therefore a testament to how much good stuff is being written that while I'm not nominating any of the best novels, I'm happy to see each and every one of them as an award finalist and I don't envy those who have to pick a winner. Speaking of which, I guess I now have some last minute reading to do before ballot deadline day… and still some great surroundings to do it in. Pura Vida, chic@s! Joe: If I’m being so bold to put myself over, I’ll note that four of finalists for Best Novel were on my Best of the Year list and were all ranked my Top Five (with my fourth spot going to Seanan McGuire’s excellent Beneath the Sugar Sky, a novella I would have absolutely loved to have seen on the Nebula ballot). 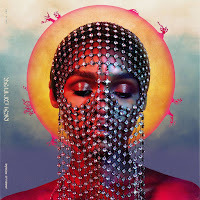 I’ll close on this: Janelle Monae is nominated for a Nebula / Bradbury Award and it’s pretty awesome that as much as so many of us love her music and her aesthetic that she is being formally recognized in our spaces. Maybe a Hugo will be next? 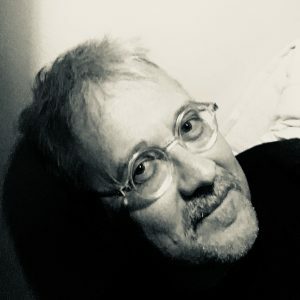 Joe Sherry is a co-editor of Nerds of a Feather, 2017 & 2018 Hugo Award Finalist for Best Fanzine. Minnesotan. Simon Ings is a novelist and science writer living in London, England. When he isn't writing novels, and science books, he is writing reviews for FT, The Spectator and the Daily Telegraph. Find him online at simonings.com ,https://www.instagram.com/simon_ings/ and @simonings. His newest book is The Smoke. Today Simon shares his Six books with us. This winter, for the first time in years, I spent Christmas alone. I figured that since I was going to be a grumpy bugger, I had better make a virtue of necessity. 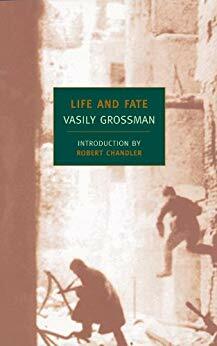 A litre bottle of frozen vodka and Robert Chandler's translation of Vasily Grossman's Life and Fate (think War and Peace for the Stalinist era) did the job nicely -- up to a point. Two-thirds of the way through, its cast of thousands got all tangled up in my head, so now I'm having to re-read the bloody thing. Why am I doing this to myself? That title's no joke, by the way: there's a whole world here, and all of it is burning. 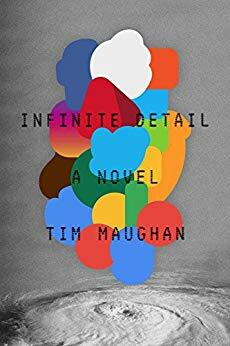 My mate Tim Maughan has his first novel out from FSG in March. Infinite Detail is set five minutes into the future, in a corner of Bristol not a stone's throw from where I began what I laughingly call my career. So lots of unearned roman a clef moments are assured. Talking of futures, Paul Dobraszczyk's Future Cities: Architecture and the Imagination has just come in from Reaktion Books. Not your usual Verne/Robida medley, this promises to take speculative design and design fiction out of the hands of -- well, people like Tim Maughan, actually -- and to place it bang in the middle of architectural practice. There's nothing new under the sun, my friends, and least of all the new. One of the many things I hate about myself is that I never bother to re-read anything. 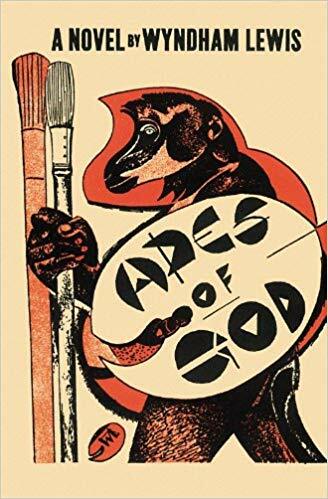 The book that's been burning a hole in my bedside table for years is Wyndham Lewis's satirical epic The Apes of God. It gave me the voice I was sorely missing for my second novel, and I swore blind at the time that it had changed my ideas about the sort of writer I wanted to be. I have no idea now what I was on about, and am almost afraid to find out -- so there it still sits. Because I don't re-read, I never really develop such nice nuanced relationships with books. What I do tend to do is build ridiculous edifices of received opinion against works I'm frankly too afraid to tackle. I can't be the only one, I mean who has actually had the temerity to read Joyce's Ulysses? I'll tackle Freud before that. Freud is like Death. The more you run from him, the greater your risk of running into him. Time for me to face the music. John Christopher got under my skin as a child and has never let me go. Kids' books like The Prince in Waiting fed me those nostalgic and valedictory notes you need if you're going to write into the British fantasy tradition. 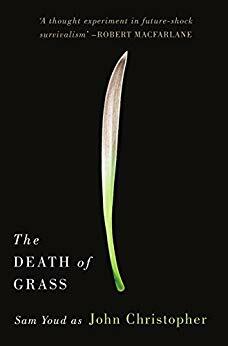 Much, much later I discovered the man had teeth: Death of Grass is a sort of John-Wyndham-without-the-apology tale about how personal virtue actually works in a disintegrating culture. Kindness is not a virtue. It is a sentiment. There, I've said it. But JC said it first. 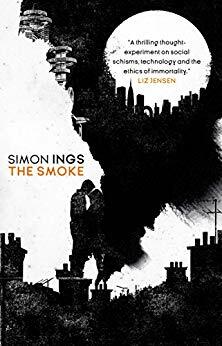 It's a novel called The Smoke, about London (there is no better city), and tribalism, and about how there can never be an "us" without a "them". And it's about all the work we do, sincerely and with good will, to negotiate around that awful fact. The Smoke is awesome because, along with the speciation and the spaceships, it's a love story, a twisted memoir if you like, about the woman to whom the book is dedicated. She's gone now -- which is where we came in. This past week I had the good fortune of attending the Alita Experience with my family and watching the new movie from Robert Rodriguez and company. After hanging out with my family at Kansas Bar and solving some puzzles in Iron City, we were excited to check out the movie. We were all pleasantly surprised with the movie and hope that it does well enough to bring us a sequel. I have been reading the manga on ComiXology Unlimited and am impressed with the movie adaptation. Now I need to track down the anime from the 90's. 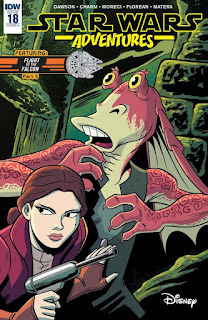 Star Wars Adventures #18 - This all-ages book continues to entertain as we are treated to some classic Jar Jar hi-jinx! You may not have the same affinity for our clumsy Gungan friend, this short story focuses on Amidala helping Jar Jar find a lost treasure for Boss Nass. We are treated to a series of tests that Amidala conquers with her wit and bravery and Jar Jar stumbles through despite being a bumbling fool. If you don't want any Episode I flashbacks you may want to steer clear of this title. If you have a soft spot in your heart for Jar Jar and the intent of Episode I like I do then this will be right up your alley. 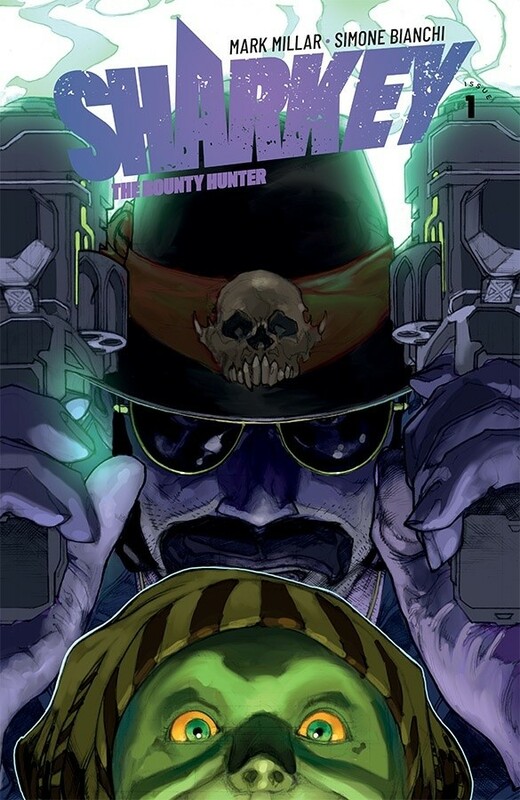 Sharkey The Bounty Hunter #1 - Mark Millar's partnership with Netflix continues with a sci-fi mini-series featuring a Bounty Hunter and his 10-year old buddy he agrees to take across the galaxy after arresting his uncle. Millar does a nice job introducing us to the seedy world that this series exists and to a cast of characters that are going to plan a big role as a billion dollar bounty has just been announced. While on paper it sounds a little Cowboy Bebop/Firefly-ish, I have a feeling that Millar will push the boundaries on what Netflix will allow him to produce and the story is likely to be more succinct as this is being developed into a film. While I wasn't blown away by the first issue, I am intrigued enough to see where this is headed. It felt like I just watched a pilot that I am green-lighting for a full season. 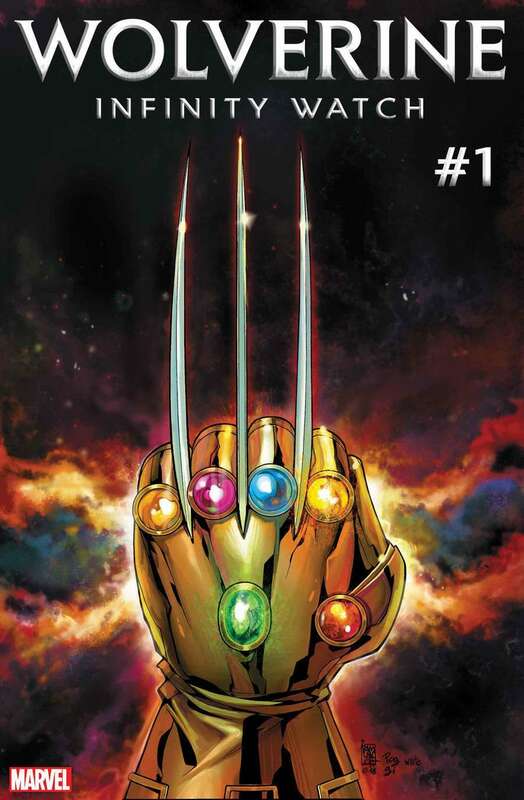 Wolverine: Infinity Watch #1 - With a cover like this there was no way I could avoid this book and am somewhat confused and itching for the next issue. Gerry Duggan gives the readers a quick summary of the events that have happened in the Marvel Universe over the past year and with how many times the Infinity Stones have re-written things, brought people back from the dead, and countless other changes, I am at a bit of a loss. Having said that, Wolverine is back and the Infinity Stones have now been fused with the souls of select individuals thanks to Adam Warlock. It seems a new quest for the stones is upon us and I do enjoy a good quest. First stop is my home state of Texas to boot! 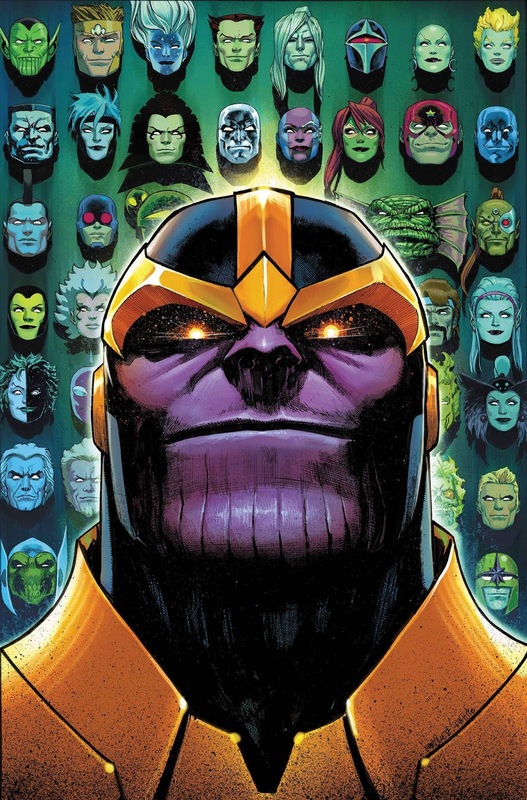 Guardians of the Galaxy #2 - When we last left this title a while back Thanos' body, minus his head, had just been taken by the Black Order following his death. Gamora, who just killed Thanos, fled after she nearly destroyed the world. Thanos had a plan to avert death by uploading his conscious into a worthy host and it is feared that Gamora is that host. The Black Order seeks to kill Gamora and the newly formed Guardians is leaning towards saving her. That is if Starlord can come to grips with the fact that Gamora "killed" him. Leckie's foray into fantasy delivers on mythology and worldbuilding, told through a distinctly non-human lens. Ah, ravens. They're smart, they're beaky, they come in murders, and many in our world are better Londoners than I am. They're also the subject of more than their share of both folklore and, through that, fantasy interest. Whether they're harbingers of death, guides to the spirit world, speakers of prophecy and truth or otherworldly tricksters, there's a lot of mileage in these feathery next-level dinosaurs. Now, in Ann Leckie's first novel-length foray into fantasy, a raven god is front and centre, alongside a cast whose human members often play second fiddle to their divine counterparts. Many readers will be familiar with Leckie for her science fiction work: the superlatively brilliant Ancillary Justice, its sequels, and the same-universe standalone Provenance. On the surface, The Raven Tower is a very different book. We find ourselves in Vastai, a low-tech, small-scale polity, whose citizens fear and worship the forest, envy the better harbour of their neighbour (in one timeline, at least) and have come to rely on the blessings of a specific god to keep their town flourishing. 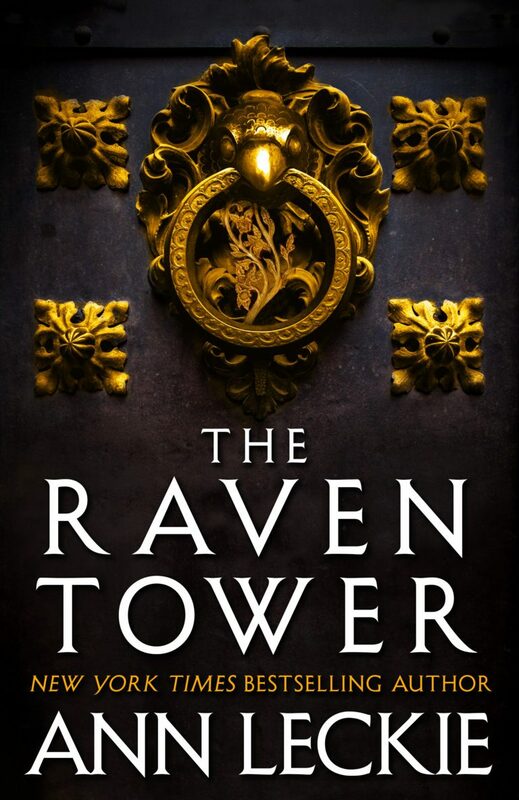 Gone are the spaceships and corpse soldiers, but the presence of the gods themselves - who are very much real in this world, and regularly appear to humans - means that The Raven Tower feels just as connected with non-human intelligences as Leckie's previous works, and just as accomplished at giving those intelligences believable motivations and voices. The Raven Tower leans into its myth-heavy, language-driven setting, not least by setting up a second person narrative: a mysterious voice who addresses the ostensible protagonist, Eolo, as if telling his own story to him. In the opening scenes, this narrator is present but not directly involved in the action, and the voice's narration of these scene-setting events - in which Eolo's companion Mawat, the heir to the Raven Tower, returns to witness the death of his father - feels oddly full of conjecture and uncertainty, as it reflects both Eolo's uncertainty and the voice's own unfamiliarity with him. This uncertainty is a jarring place to start a story, but it's worth the effort as we establish the parameters of the world of Vastai: a land ruled not by a monarch but by a "lease", a hereditary ruler given powers and privileges by their Raven god, but compelled to sacrifice themselves when the Raven's "instrument" (their animal body) dies. Mawat, who has been brought up expecting to ascend on his father's intentionally premature death, arrives back to instead learn that his father appears to have fled the tower and his uncle has taken on the Lease's position instead. This should be impossible, based on how the Raven has always operated, and Mawat's reaction to the discovery sets in motion a chain of events that threaten the very foundations on which the Tower and its inhabitants stand. It very quickly becomes clear, however, that this is not just Eolo's story, but that of our narrator - and that our narrator is not, as it initially seems, a human servant in the Raven Lease's employ, but a god in their own right. Most often referred to as The Strength and Patience of the Hill (though, for the sake of simplicity and help anyone still skimming while hoping to not get too spoiled, I'll keep referring to them as "the narrator"), the character addressing us is revealed to be immeasurably old, potentially very powerful, and has sat unmoved through geological ages of change and comparatively recently found themselves interacting with humans. Existing fans of Leckie's work will find it easy to believe in her ability to turn this narrator - a large rock who hates almost all change on principle - into the novel's most compelling character. From here on out, the second-person adventures of Eolo and the humans of Vastai are interspersed with the narrator's history and their interpretations of the events of the present. In Leckie's world, gods gain power from human worship and offerings, and are able to change reality using this power - but they must be careful not to deplete their own strength in doing so. The risk a god of any size faces is how to ensure they can sufficiently impress and meet the demands of their worshippers - and, perhaps, see off challenges from rival gods in the process - while not giving up too much of themselves in the process, or making promises that force them into doing so in future. What the narrator's identity does mean is that the characterisation and interactions of the human characters in the "present" sections are deliberately viewed through a lens of distance and opaqueness. It takes some considerable time to gain an understanding on Eolo beyond what the narrator guesses about him at the start of the tale, plus a few external observations which make it clear that he is a trans male character; many of the other human characters are given only hints of characterisation through understated or indirect means. While this is entirely in keeping with the position of the narrator and their understanding of humans (and selective interest in what makes them interesting), it did make the start of the novel slower and more challenging to get into than I expected. Leckie is so good at portraying human modes of affection and care (even when they're being filtered through non-human characters like Breq) that it's hard not to miss that here, but the comparative lack of focus on relationships and connection in the novel's early stages means that the connections that do develop on the page - not least that between the narrator and The Myriad, a fellow god who enjoys manifesting as a cloud of mosquitoes - are that much more precious and interesting. As you'd expect from an author with Leckie's skills, the plotting, especially the weaving together of the past and present narratives, is spectacular. Central to this are the twin mysteries of the book's past and present: what's going on with that whole Raven Lease thing, and, somehow more interestingly, how did a rock whose sole previous experience with movement was "hover off the ground by a foot for a few minutes" apparently travel hundreds of miles to become linked with the Raven Tower? Again, likely because of the nature of the narrator, it was the human plotline that took longer to warm up for me, but once it does it's pretty great, setting up a culture whose elites are intricately tied to gods whose reality and power has never been questioned. Of particular note is the delegation from Xulah, a trio of foreigners who take an early interest in Eolo but clearly have their own agenda at play, involving their own snake god and Vastai's larger neighbour Ard Vustika. However - and given the banal content of some of these scenes, I can't quite believe this is true - it was the elements from the narrator's past that I found myself waiting for, time and time again. This means, just to be entirely clear, that I was comparatively speeding through sections on political intrigue and protest in order to get back to the narrator's time waiting out a mini ice age or establishing god-specific language for B vitamins. The characterisation is just that good. Ann Leckie's last couple of books have been on the comfort reading side for me, and on a personal level, I did miss that from The Raven Tower. However, that should in no way be taken as a criticism of what it does deliver. 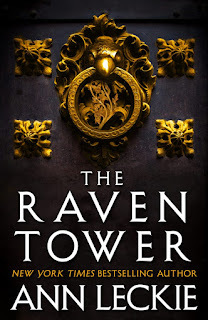 The elements that make The Raven Tower dense and alien and unsettling are also what makes it so good, and if you give it time and attention, this is an immensely rewarding read. I'll be eagerly watching the skies for Leckie's next book, and giving any giant rotating stones and smart-looking ravens in my future the respect they clearly require. Reference: Leckie, Ann. The Raven Tower [Orbit, 2019]. There's a fine line between an anthology not really holding together and being intriguingly diverse. 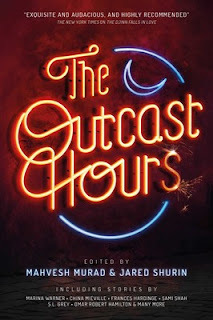 Every reader of The Outcast Hours by Mahvesh Murad and Jared Shurin probably has their own opinion on which side the book ultimately falls for them. It is very diverse: there are stories about a toothfairy, feuding apothecaries, a babysitter for criminals' children, a babysitter for homeless dogs. Sam Beckbessinger, Lauren Beukes and Dale Halvorsen's opening story is one of the best pieces of socially relevant occult gore short fiction I've ever read – I confess I didn't know there's such a niche before picking the book up. Night is a great theme for a short story anthology. It is mysterious, atmospheric, intriguing, fleeting and uncertain – as all enjoyable art and fiction – so there's plenty of room to play with and not too many restrictions on where you can go. My main criticism of the anthology is that quite many of the stories leave these possibilities on the table and focus on night just being synonymous with darkness. I mean, in some stories, night is not a mysterious landscape for whatever you can dream up. Instead, it's a place of nightmares. On the other hand, that's probably entertaining for readers who enjoy whispering to their protagonists that going down to the basement with an enigmatic, sargophagus-collecting millionaire in Karachi or to the home of a bit-too-eager Tinder date in New York City is arguably not the best thing to do if you're in this kind of a book. Nevermind the continent, your chances of living long and happy are going to take a dive. However, this whispering business is not what I'm into when it comes to horror. I appreciate horrific stories that do a little more to make me afraid than relying solely on a spooky twist-ending, as demonstrated by Beckbessinger, Beukes and Halvorsen's great opening for the book. I fear that even that would have lost some of its power if the editors had decided to place it deeper in the anthology after some other horrors had numbed my senses first. The best part of reading anthologies like this is of course discovering interesting new authors you had never heard of before. For me, the most promising new acquaintance is maybe Matt Suddain whose tale about two chemists in a weird fantasy (or maybe not) town that is too small for both of them is quirky, weird and suggestive with perfect dosages of each. Suddain delivers his simple story just right, which isn't that easy to do. In the short space that each story is given, some tales feel that they would have what it takes for being longer, whereas some others seem a bit forced at this length. Couple of the stories would probably have worked better in the same form as China Miéville's ambient one-or-two-page microstories or vignettes sprinkled through the book, as not very much is always happening. Because the stories are so short, there's a lot of them – 25 in total, not counting Miéville's nine short-shorts. There's something to like and dislike for everyone, and the best way to experience The Outcast Hours is perhaps not to accelerate through it (it's a rapid series of accelerations and sudden stops) but rather to read one or two before before going to sleep – or at any rate before the night comes. 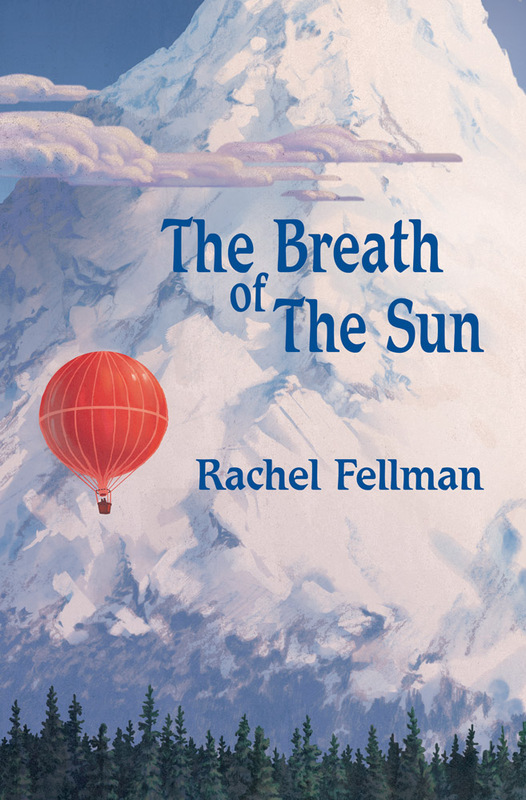 Nerd Coefficient: 7/10 – "An enjoyable experience, but not without its flaws"
The Breath of the Sun is a novel about the journey, not a destination. Rachel Fellman's debut novel is a deeply thoughtful meditation on mountain climbing, religion, relationships, regret, loss, and probably more. There is a mountain so large the peak isn't visible and special suits are required to even attempt a serious attempt at a summit, a mountain so large it is revered as a god. There might be magic, it might be a less understood form of science. The story of The Breath of the Sun isn't about conquering of a god or about some mystical adventure. It's a personal story, an intense and icy travelogue, a character study, and it is absolutely wonderful. 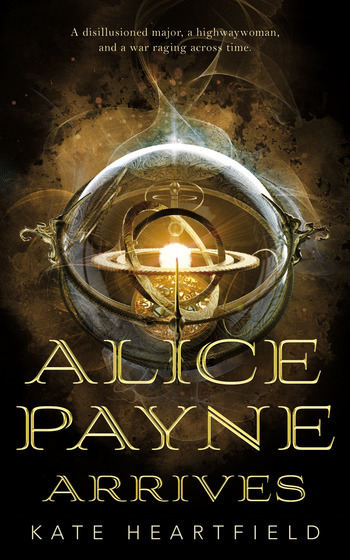 After two novels focusing on Alex Price, Seanan McGuire returns to the protagonist of the first two novels of the Incryptid series Verity Price. Verity has given up her dreams of competitive dance and has turned to the family trade of being a cryptozoologist, dedicated to preserving and protecting those non human creatures the rest of the world only believes are myth (if even that). That is, until she gets a call to participate in an all-star season of Dance or Die, the reality dancing show she was once a runner up on. 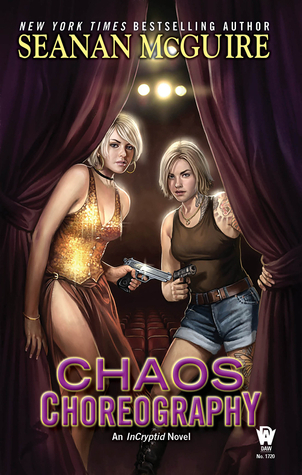 Chaos Choreography is the fifth Incrytpid novel, so by this point you have a really good idea of what you're going to get. For a fifth novel, this is a surprisingly good place to jump into the series since McGuire does enough of the work to smooth the ride. Sure, you won't be nodding your head in understanding certain callbacks, but you have what you need. If you haven't been following the series, you get: a good dose of "weird" creatures being perfectly normal, conspiracy, action, murder, cultural understanding (and misunderstanding), attempts to be better, wise cracks, tension, and excitement. We learn more of Verity's family and the wider crytpid world. It's a delight. 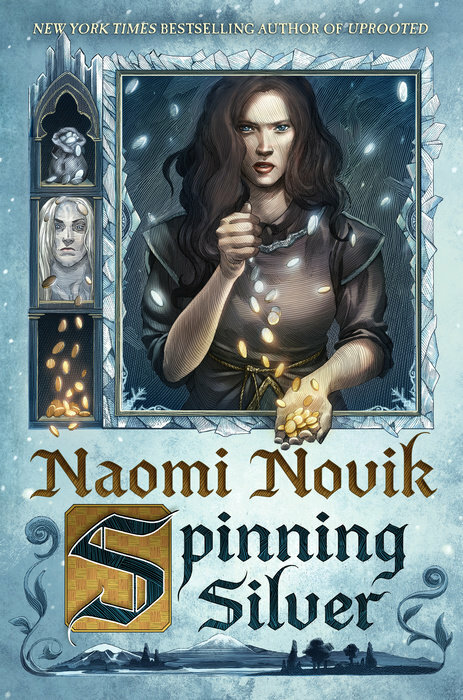 Magic for Nothing is the sixth Incryptid novel and the first to feature Antimony, the youngest of the Price siblings. Magic for Nothing is all about the fallout from Verity's actions at the end of Chaos Choreography. The Covenant of St. George knows that Verity is alive and they're coming for the Price family. How to get some intelligence about what the Covenant is planning? Send Antimony under cover. By this point you either trust McGuire to tell a hell of a story or you don't, and if you don't there's no reason to be reading this far into a series. McGuire tells one hell of a story and with Magic or Nothing we get our first look inside the Covenant as well as a deep dive under cover at a circus (plus a little roller derby). Through the first five novels Antimony has been a character mentioned, referred to and described, but never seen. There's been an outside view suggesting that she's a nearly homicidal child, but the truth is never that simple and Antimony is a far richer character than we could have guessed (besides being written by McGuire, which then we just know that she will be). 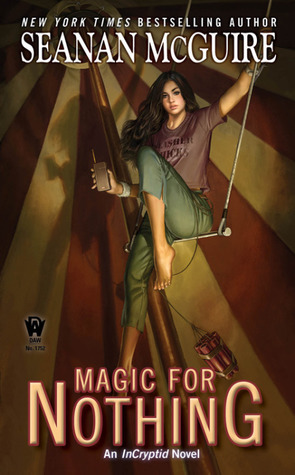 Maybe don't start reading Incryptid with Magic for Nothing, but absolutely keep reading the series because this is another satisfying novel from Seanan McGuire. The Song of All uses Saami culture and mythology, as well as a crunchy set of characters and motivations to portray a frozen and bloody tale. Irjan just wants to live a peaceful life as a farmer on the cold fringes of the tundra with his wife, Sohja. He has a past that he has not told her about, and frankly would far sooner forget. But when an ambitious priest decides that his key to escape the hardscrabble life on the edge of civilization is to motivate Irjan to action by means of a violent tragedy inflicted on his family, Irjan’s course will affect not only himself, the life of his child, or his people, but the fate of two races. This is the story of Tina LeCount Myers’ The Song of All. The opening chapters of the novel felt a bit rough and rushed, with the inciting incident of the novel coming off tempo. The novel feels like its in too much of a hurry to get to that point, at the expense of setting it up better. I think it could have been foregrounded better. We only afterwards really get a sense of who and what and why, and what it all means. Once the novel gets past that and we get into the meat of the story, the novel settles into its strengths. Once we get a real sense of what Irjan is about, the black tragedy of his arc makes for a dark, but compelling read. Combine that with the Japmemeahttun, the race of immortals that man once warred with and that some would see that war prosecuted again. Theirs is a dying, diminishing race, who are raging against the dying of their light, but the press of mankind means that their days do indeed seem to be numbered. The slow inexorable decline of their race brings to mind novels revolving around the tragic fall of the Fae, particularly in, say, Poul Anderson’s The Broken Sword. Indeed, not to spoil some things revealed in the background of the novel, there are other parallels to be made, too. But while The Broken Sword goes for Norse and Germanic myth for its taproots for its worldbuilding and sets it in our Dark Ages, The Song of All elects to go northeast, to the Saami and Finish cultures and mythologies and stay strictly in a secondary world. This is not quite borrowing from the Kalevala, but it is inspired by the culture and legends. The author has a penchant for a lot of loan words, further grounding the worldbuilding in that culture. While the language of the novel is descriptive and immersive, the author does not go into tremendous worldbuilding detail. We feel the cold thin existence on the edge of the tundra, writing that seeps that cold into the bones, but it's written so that the reader can bring many of the details themselves, rather than going into deep depth of description. It’s evocative rather than plainly descriptive writing, but it works very well for that. Irjan's story is at the heart, but the novel is full of characters with hopes, agendas and plans of their own. The scheming Apotti (priest), Rikkar.. His assistant, Siggur, equally ambitious in his own right. The Japmemeahttun, Ailllun and Djorn, seeking to try and follow the precepts and traditions of their culture to keep their race alive. And more. However, in addition to a bit of a rough opening, I was not entirely satisfied with the end matter of the book. The novel, after that very solid core, suddenly slingshots the narrative far into the future in the last, shortest portion of the novel. That future feels much more sketched in, world and character wise, as compared to the richness of what has come before. That section seems to exist more for an event to occur than anything else, and it left me questions about the intervening years and just what has happened in that gap. I do understand wanting to, and being motivated to skip the “dull bits”. With the majority of the book being so deep and rich in the characters and the plot, this felt like a too brief wade into the future of the series (there is another book coming) and it feels like an unsatisfactory bridge to me, thereby, to it. 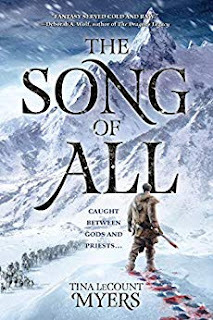 Overall, however, the vividity of the characters and the plotting, and the language of the novel made this an enjoyable and intriguing epic fantasy experience to read. I will be curious where the series goes from here, based on the events of that last section.